The prestigious award is given each year to an AMP member who has demonstrated exceptional leadership in order to further the mission and vision of the Association. Tsongalis was also commended for the dedication he has shown over his career to applying new molecular techniques to diagnostic questions that are not adequately addressed by traditional laboratory methods. Founded in 1995 to provide structure and leadership to the emerging field of molecular genetics, AMP is a global, non-profit scientific society with more than 2,300 members that works to advance the clinical practice, science, and excellence of molecular and genomic laboratory medicine through education, innovation, and advocacy to enable highest quality healthcare. “It was incredibly humbling to be recognized in this way, for a couple of reasons,” says Tsongalis, who received the award at the AMP 2017 Annual Meeting held recently in Salt Lake City, UT. “The first is that AMP is the premiere association for molecular diagnostic pathology, which is the ‘new wave’ of clinical diagnostics, and the past awardees are all good colleagues of mine from around the country. Tsongalis has been an active AMP member since 1995, serving as president of the Association in 2008, chair of the Program Committee in 2005, and director of the Molecular Genetic Pathology Review Course in 2017. 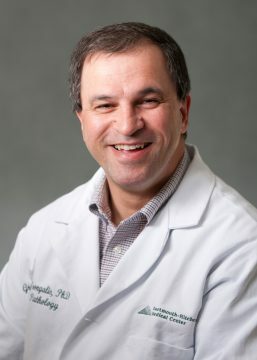 He has also served on AMP’s Nominating Committee (1996), Genetics Subdivision Training and Education Committee (1998), Solid Tumors Training and Education Committee (2001), Infectious Diseases Clinical Practice Committee (2003), and as the leader of numerous work groups and projects.